Mrs Frances Monteith was one of the earliest female Scottish photographers, her work preserved in a rare collection of prints complied by Sir David Brewster. Frances Dunlop was the daughter of General James Dunlop (1759–1832) Julia Baillie, baptised at Penzance, Cornwall, on 18 January 1805. Her father had a distinguished military career with the 59th Regiment of Foot in Cornwall guarding the English south coast during the Napoleonic Wars. Frances may have been named after her paternal grandmother, Frances Anna Dunlop [née Wallace], (1730–1815), who was an independent and intellectual woman also a friend of the poet Robert Burns (1859-1896). Frances’ early life would have been spent on the family estate at Southwick, Kirkcudbright, and, as her father was MP for the Stewartry of Kirkcudbright from 1812 to 1826, she is also likely to have spent time in London. On 9 July 1838 Frances married advocate and later Sheriff of Fife Alexander Earle Monteith (1793–1861) in Edinburgh. Monteith was previously married to Emma Clay who died in 1830. Frances’ only child Anna Julia was born on 19 September 1842, whilst already caring for her step daughter Mary Anna Monteith. 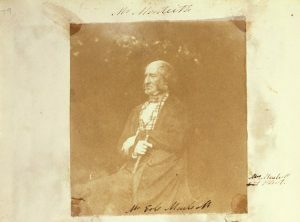 Alexander Earle Monteith was a respected figure in the establishment of the Free Church of Scotlandand “kept well up with the reading of the day in literature, science and art, and cultivated the society of men eminent in these branches.” These connections would provide an introduction to photography. 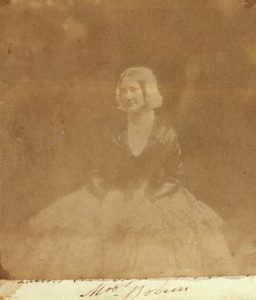 Frances was identified as the calotype photographer of images appearing in an album belonging to Sir David Brewster (1781-1868). The Brewster album contains a unique catalogue of works by the greatest early Calotype photographers. Frances is in the prestigious company of Hill and Adamson, Nikolaas Henneman, Sir John Frederick William Herschel, M.H. Nevil Story-Maskelyne and Sir David Brewster. Three photographs are captioned Mrs Monteith/Phot. The photographs are salt prints from calotype negatives and captioned: Mr Earle Monteith, Mrs Brown and Sir James Dunlop Bart. A further photograph captioned Inverleith Grounds may be a further example of Frances’ photography, though attributed to Robert Adamson. Inverleith House (now part of the Royal Botanic Garden Edinburgh) was the Monteith family home until Frances moved to London in later years and is presented adjacent to Frances’ portrait of Sir James Dunlop (1830-1858). Sir James Dunlop also became a photographer appearing in the albums of the Edinburgh Calotype Club, claimed to be the first photographic club in the world. Frances may have introduced Sir James Dunlop to photography which he pursued with distinction. His images are preserved by the National Library of Scotland in association with Edinburgh City Libraries, in the National Galleries Scotlandand Maitland Album. Frances’ portrait shows Dunlop at approximately fifteen years old. 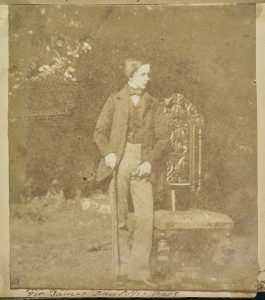 Alexander Earle Monteith and his friend Sir David Brewster were photographed several times by leading photographers David Octavius Hill (1802-1870) & Robert Adamson (1821-1848). It remains speculation whether Frances could be the subject in one of their Unknown Woman collection of images. Most of the members of the Edinburgh Calotype Club became founder members of the Photographic Society of Scotland when it was established in Edinburgh in 1856 but although membership was open to women and several did join, Frances is not among them. Frances played an active role in Free Church fundraising in the company of Mrs Brown, Douglass. The two ladies appear in a notice for an 1853 sale of ladies work in St Andrews, and again in 1858 forming a committee to raise funds for the building of a hall. Following the death of Alexander Earle Monteith in 1861, Frances and her daughter moved to London where census records show her remaining until her death on 25 November 1898 aged 93. Her funeral, however, was held at St John’s Church, Princes Street, Edinburgh. My grateful thanks to Roddy Simpson, Honorary Research Fellow, School of Culture and Creative Arts, University of Glasgow, for extensive research into the life and work of Frances Dunlop Monteith. John Hannavy (ed. ), The Encyclopedia of Nineteenth Century Photography, Routledge, 2008, Vol. 1, p. 452. Julie Lawson, “Sir James Dunlop, a Photographic Prodigy”, Scottish Photography Bulletin, Autumn 1986, pp. 11-13.